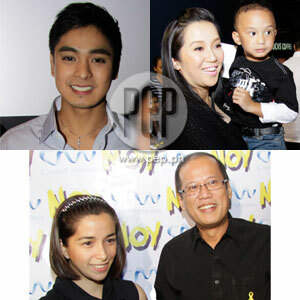 The docu-film Noy starring Coco Martin (upper left photo) had a star-studded premiere at the Power Plant Mall last night, May 28. Kris Aquino watched the film with her sons Josh and Baby James (upper right frame). Senator Noynoy Aquino's girlfriend Shalani Soledad (left, lower frame) found it "very realistic." When Senator Benigno "Noynoy" Aquino III was introduced last night, May 28, at the premiere of the film Noy, he was referred to as the President-apparent. When the credits rolled, the film said it was dedicated to the President-apparent. Sen. Aquino was the guest of honor at the premiere night of the docu-film, which was conceptualized, co-directed, and co-produced by lead star Coco Martin. Noy contains a mix of actual documentary footage as well as dramatic scenes revolving around an impoverished family living in the flooded area of Malabon. For six months, the ABS-CBN actor joined the campaign rallies of the Liberal Party in 20 provinces. Coco's character, nicknamed Noy, poses as a journalist commissioned to create a documentary following the campaign trail of Sen. Noynoy Aquino during the 2010 Philippine national elections. Produced by CineMedia and distributed by Star Cinema, the docu-film will open on June 2. "VERY REALISTIC." How would the Senator describe the performance of Coco in Noy? "Tayo rin naman ay nag-shoot na ng mga commercials, pero saglit lang yun compared sa ginawa niya dito," Senator Aquino points out. "Yung conditions hindi ganun kadali kasi kampanya mismo yun... Ang daming gustong magpa-picture sa akin at makipagkamay. At mapapaniwala niya tayo na ang buong pagkatao niya ay character na Noy, nagampanan niya sa conditions na hindi ideal. Nakaka-impress. Malayo ang mararating ni Coco." Even Shalani Soledad, Sen. Aquino's girlfriend, praised Coco's portrayal and described the film as "very realistic." In this film, viewers will be able to see Sen. Aquino share his future plans for the Philippines, his bonding moments with nephews Baby James and Josh as well as the fun times he had while rapping in a studio for one of his commercials. How does Sen. Aquino feel about people seeing a different side of him through this film? "Wala naman po akong tinatago. Akala ko noong una na documentary ang ginagawa, yun pala may sine within a documentary. Natawa nga ako dun sa eksena dun sa wheelchair, akala ko seryosong nagtatanong [si Coco]." He was referring to the scene wherein the character Noy asks the politician for a wheelchair for his invalid brother (portrayed by Joem Bascon). After that scene was shot, only then did the Senator find out that Noy was actually being made as a docu-film, not a straight documentary. The standard bearer of the Liberal Party recalls how the film was painstakingly created for six months. "None of that was staged... Ang dami po nating ginagawa noong panahon na 'yon at mas marami bukas pag tayo ay nag-assume ng opisina." When asked to discuss his future plans for the movie industry, the President-apparent told the media, "Nag-umpisa na po kami sa pamamagitan ng pagbaba ng amusement taxes na napababa. Ang committee ko sa local government ang tumalakay dun, mungkahi po ni Senator [Bong] Revilla dahil nga onerous naman ang taxes sa inyo. Parang may normal na taxes at may plus, plus. "Yun po ang matutulong natin sa ngayon at tayo ay bukas sa lahat ng sector sa lipunan." KRIS AQUINO OFFERS OWN ENDING. PEP (Philippine Entertainment Portal) had the chance to ask Kris Aquino about her opinion on the movie and she gushed, "Ako, nagandahan talaga but commercial talaga ang gusto ko, ayokong mamatay si Noy. Hindi ba puwedeng nabuhay siya at nagkaroon siya ng trabaho sa RTVM [Radio-Television Malacañang] or sa Malacañang (Laughs). "Pero hindi ko naman pera, hindi ako ang producer. At mas gusto nilang maging mas makatotohanan. Kasi ang line of thinking ko, pang-happy ending." What does she think about the portrayal of Noynoy in the film? "It's very true. What you see is what you get talaga." When asked regarding speculations that her brother might appoint TV host Boy Abunda as ambassador, Kris said with a smile, "Ambassador to where? Wala 'kong alam dun." PEP also asked Kris if she has future plans to help the movie industry and she replied, "Nangako ako kay Senator Jinggoy [Estrada] na hindi ko siya ipi-preempt dahil mayroon siyang magagandang plano." Kris arrived at the venue with her sisters and her children Baby James and Josh. KAPAMILYA STARS GIVE FULL SUPPORT. Coco and Kris's co-stars in Kung Tayo'y Magkakalayo were among the ABS-CBN stars who graced the event last night. Gabby Concepcion, Gerald Anderson, Kim Chiu and Maricar Reyes watched the docu-film. Francine Prieto, who was introduced as a kontrabida in Kung Tayo'y Magkakalayo last month,was also present at the special screening. Joem Bascon, Baron Geisler and Ping Medina were among the cast members spotted at the event. Jason Abalos, Enchong Dee, Nikki Valdez, and Johan Santos of Pinoy Big Brother Double Up, were also there. The cast members of the political drama Tanging Yaman—Mylene Dizon, Agot Isidro and Rowell Santiago—were also present to show their support for their co-star Erich Gonzales. As the leading lady of Coco Martin, Erich had many kissing scenes and even shot a love scene with the character Noy. Noy has been rated PG-13 by the Movie and Television Review and Classification Board.